So it turns out that Bundoora Homestead Art Centre is bit of a sparkling gem on the open plains of the northern burbs. It’s an incredibly beautiful place, stained glass ceiling panels, carved hardwood staircases and, best of all, it’s full of rooms dedicated to art. One of the spaces just adjacent to the homestead is the Access Gallery and that’s where I found the most captivating stuff. Poetic Forms brings together a group of artists who all went through art school together and investigates what threads still hold them together as a group, artistically. There’s relationships that continue to exist between their work, as there was when they studied together. 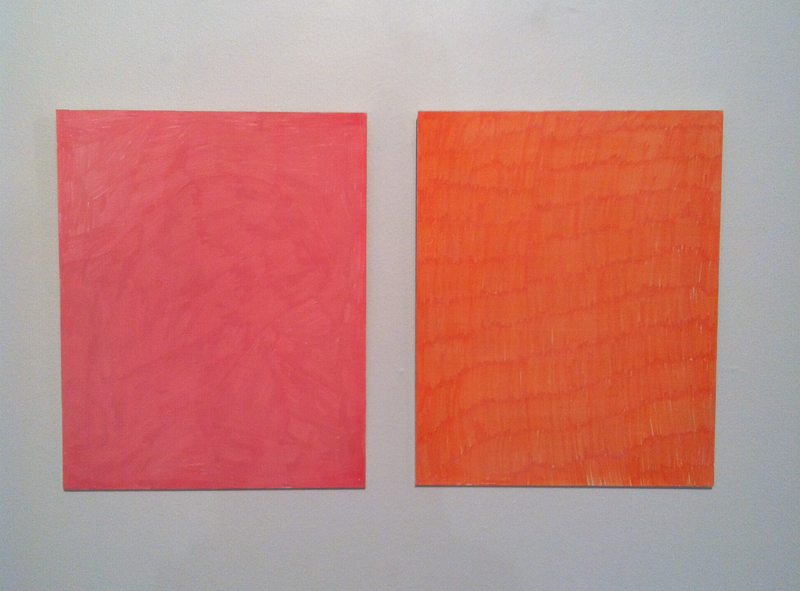 They are bound by a focus on abstraction, colour considerations and mark-making. But then, as with any expression, there’s unique individuality for each artist. I know these guys from Monash. They came through the year after I did and it was at a time when the school was starting to assert itself as a major player, churning out some really motivated emerging artists under the tuition of some pretty amazing established and developing artists. It’s impossible not to feel the influence of John Nixon, who was notably inspiring and encouraging as a teacher. But now, after 6 years, you can clearly see unique voices at play here. But wait … how can you see voices? Well, oddly enough, with this sort of artwork – and with a title like Poetic Forms to emphasise the point – there is a feeling of synaesthesia. Composition, tone, vibration: all these things equally express an aural and a visual outcome. And it’s most evident here in works by Renee Cosgrave, Merryn Lloyd and Stephanie Stott. And perhaps most referentially relatable to some of Meagan Wyke’s work where art-historical connections (in this case the touchstone would be Kandinsky) are rife. 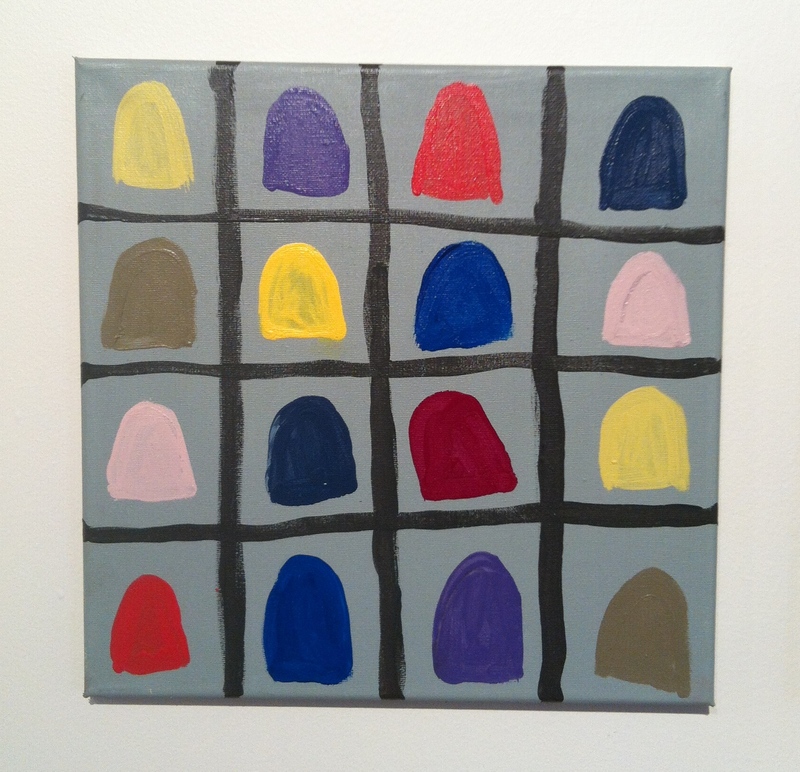 Renee works in simplistic abstractions that bear out some weird density that lies hidden behind the imagery. So, for example, she’ll colour in a piece of paper with an orange pencil and then title it Orange pencil covering the page. Simple, right? Well, yes. Yes it is. And, also no. What’s also there is the little rectangular sections of colouring that she is able to do with her hand on the page, in one spot, before she has to move her hand and continue. So what you end up with is an archival record of her hand’s performance across the page as she colours, resets her position, and continues to colour again. Back and forth, methodically across the page, until the whole thing is done. It’s as if, because there is no recognisable objects or subjects in her work, our mind scrambles about for the meaning, locking on to the subtle variations in colour tone, Pink Colour Palette Painting, or the awareness of the material ground – whether paper, wood or canvas; whether underpainted or overpainted, unprimed or primed. The paintings become objects, rather than representations – they are what they are. An important factor in reading Renee’s work is the way in which multiple works are presented and related. Sometimes there’s a series of sub-series. Sometimes it’s 5 works that seem completely unrelated. We are free to address each individual work as a singular artwork as well as seeing a grouping as a singular work that consists of component parts of seemingly singularity. In fact, this way of reading Renee’s work opens for us a way of seeing the group show in this same light. Merryn works in a similar way, perhaps even more so, her work reading like constellations. Or like concrete poetry. It’s the alignment or composition of individual works together into groupings that reconfigures new feelings. Merryn’s work is the most object-oriented and moves the closest toward sculpture. In fact, I’d go so far to say it is sculpture, rather than painting. Or, at the very least, it occupies some ambiguous territory between the two mediums. 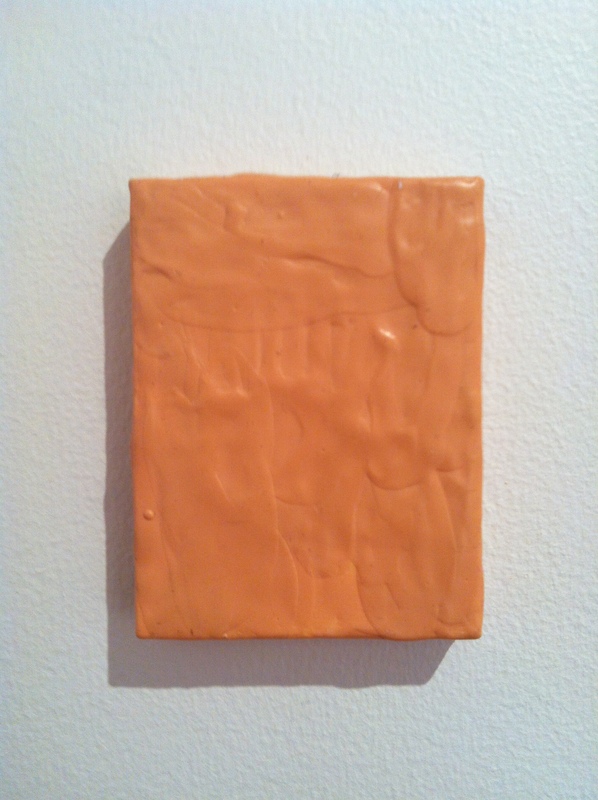 Beeswax and pigment form the foundational materials. The ground is found objects – wooden offcuts, plastic sheeting, paper, cardboard. All rough and ready. The translucency of the wax makes it organic and skin-like. Photos don’t do it justice and re-emphasise it’s objectness. And as with Renee’s work, there’s a sense with Merryn that she is absolutely compelled to create. As if there’s not a scrap of paper that could float passed her without the need for her to grab it, work on it, and send it into an evolving constellation with previous and future works. Catch, affect, release. Stephanie’s work, by contrast, is order. Is networked relation. Grids dominate and control is implied. Organic mark-making and delicate colour choice are corralled by repetition. But it’s the subtlety of the hand-made gesture that activates life and delimits any deadened categorisation or compartmentalisation. Colour is key – drawing out the relationships between the forms. Diagrammatic orientation in the work of Sally Wemyss continues the influence of control and introduces collage as a method of composition. Delicate and intricate, Sally’s work amplifies the significance of mark-making in the group. Small in scale, the works invite close inspection and reveal highly repetitive dots and dashes. There’s a sense of information flow, systemic structure and nodal networks. Forms are taped on to paper, support pins become relevant at scale, and a feeling of proposition prevails. It’s as if docking stations attach, connect flows, then detach and set about new connections. Meagan’s work has a distinctly art-historical vibe. It’s as if there’s a discussion in play between each of her works and a particular artist, like Arshile Gorky, Frank Stella, Martin Kippenberger, Giorgio Morandi and perhaps someone like John Bock in her piece Untitled (No 4). This last piece, a mirror-foil cooling bag, split open and laid flat on the wall, has a printed baroque portrait collaged on it. The hand gestures of the commercial graphic imagery on the bag and the subject of the old master portrait connect and carry across centuries. The disjunction of eras and materials splutter and spark, activating and enlivening the work. Painted directly on to doors, Tom’s work echoes Merryn’s objectness and Meagan’s art-historical discourse (Robert Rauschenberg springs immediately to mind). Three distinctly different works are presented and are most effective when the painting cuts loose and free, abandoning text for the more openly expressive play of brushstroke and colour. Poetic Forms is a well-considered show with an interesting premise. It’s the sort of show that rewards the viewer for time spent in it. A show where simplicity folds into complexity and slips away again from grasp, demanding re-assessment. It’s only on for a few more days, and well worth a trip to the homestead for. Tags: Bundoora Homstead, Meagan Wyke, Merryn Lloyd, Renee Cosgrave, review, Sally Wemyss, Stephanie Stott, Tom Reddington. Bookmark the permalink.